Move your twelve Atlantean tribesmen towards the safety of the surrounding islands. First released in 1986, this simple, fun but surprisingly cut-throat game has been through quite a few reprints and is currently available in a new edition that blends its rules and the other version called Survive! 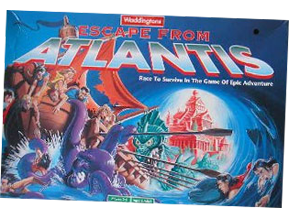 Escape From Atlantis by Stronghold Games. This summary is from my copy, the 1996 Waddingtons release that had lots of cool plastic pieces!